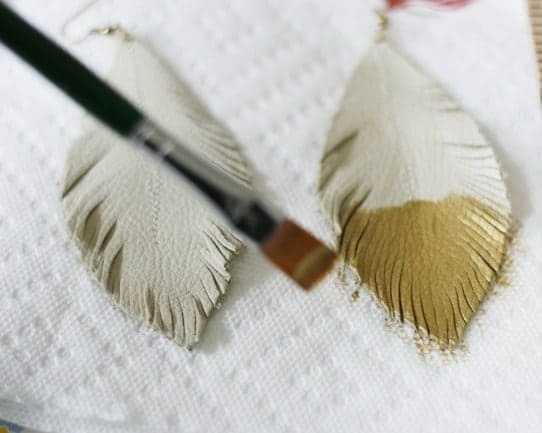 This is a very easy tutorial that will show you exactly how to make leather feather earrings and includes a free template aka leather earrings pattern. 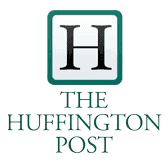 You can leave the leather earrings as is or use a metallic paint to create your own gold leather earrings. If you like the look of leather earrings, particularly leather feather earrings, but not the price tag, you can make your own very inexpensively and it’s not hard at all. These took less than 15 minutes to make and I used leather scraps, a few jewelry making supplies (complete list with links to similar items below) and metallic paint. 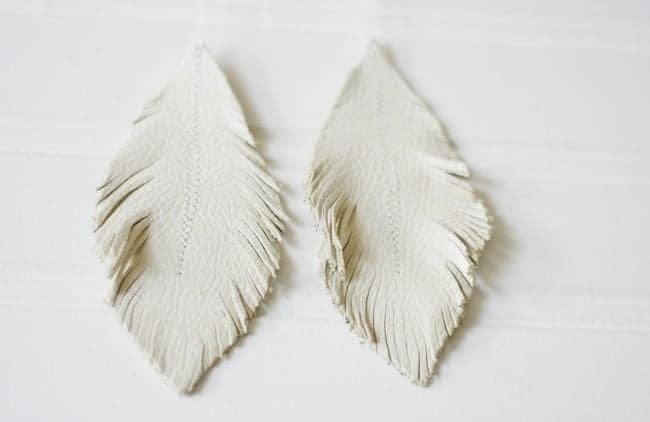 I’ve also included a downloadable feather leather earring template (leather earring pattern) near the bottom of this post. 1. 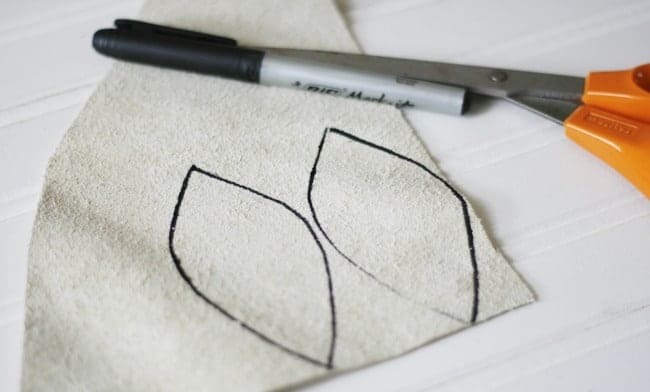 Draw the outline of a feather on a piece of cardboard and cut out. 2. Trace pattern onto the wrong side of the leather. 3. Use small sharp scissors to make fringes. 4. Sew a straight stitch down the left of center then back up to the top of the ‘leather feather’. 5. Make a small hole at the top of the earring and run ring through this hole and then add the french wire. 6. If desired, brush a light coating of the gold paint on the bottom one-third of your earrings. *Note that once this is dry you will need to gently separate the fringes. These would be pretty to wear in the spring and summer with a prairie skirt or jeans and a light weave ruffled-shirt and cowboy boots!